The collapse of the Soviet Union and the beginning of transition from a centrally planned to a free market economy marked a sharp decrease in emissions of major pollutants (Simeonova and Missfeldt, 1997; Shaw and Oldfield, 1998; Shahgedanova, 2000; Zamparutti and Gillespie, 2000). Industry has always been the main contributor to air pollution in the FSU and emissions of the main pollutants, especially SPM and SO2, have been closely related to industrial activity. 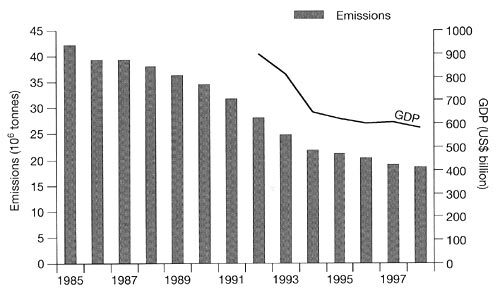 In the early 1990s, all countries of the FSU experienced a decline in GDP and an associated fall in industrial emissions (Figure 21.7). Structural economic changes have taken place; most importantly the share of extracting and manufacturing industries in the GDP has declined and especially the share of the most polluting industries such as ferrous metallurgy, metalworking, production of machinery, and building materials (Schroeder, 1998; Oldfield, 2000). For example, reductions in stationary-source air pollution in such countries as Belarus, Kyrgyzstan, and Uzbekistan exceeded the decline in industrial production. In Uzbekistan, outputs of ferrous metals, petrochemical products and building materials have declined by 40 per cent, 36 per cent, and 40 per cent, respectively while the total industrial production increased by 6 per cent between 1990 and 1996 (Shaw and Oldfield, 1998). However, in many countries (e.g., Russia, the Ukraine, and Kazakhstan) declines in industrial emissions have been smaller than decreases in industrial output, suggesting that industries are becoming more energy and pollution conscious. Economic reforms proved slow and difficult in the FSU and continuing financial hardships have ensured the low priority of environmental issues. Enterprises lack resources to install new and adequately maintain old pollution abatement equipment. In 1995, environmental investments constituted only 0.4 per cent of GDP per capita. In Georgia no capital was invested in environmental protection and only in the better-performing Baltic states was 0.6 per cent of GDP per capita invested (Zamparutti and Gillespie, 2000). Between 1986 and 1996, the capacity of new pollution abatement equipment declined from 19.6 million m3 of gas per hour to 7.5 in Russia, from 3.8 to 2 in the Ukraine, and from 1 to 0.06 in Belarus (Shaw and Oldfield, 1998). Alongside the deterioration of industrial pollution control, changing market structures have affected patterns of car ownership. The number of privately owned vehicles rose significantly between the early and the mid-1990s in many FSU countries, most notably in Belarus (by 75 per cent), Kazakhstan (24 per cent), Russia (58 per cent), and the Ukraine (45 per cent) and in many urban areas an increase in vehicular pollution has been registered. This issue is further discussed below.